I had the privilege of shooting with Emily Chastain again last weekend. 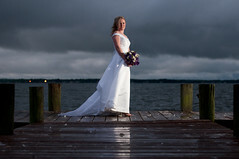 It was a beautiful venue on the Chesapeake Bay …except for that fact that it was overcast and drizzly all day. As the second photographer I was able to relax and capture the often missed moments while Emily covered all the “must-have” stuff. It was a great opportunity to try some new stuff without the pressure of having to get every single moment. Here are a few of the shots I came away with.